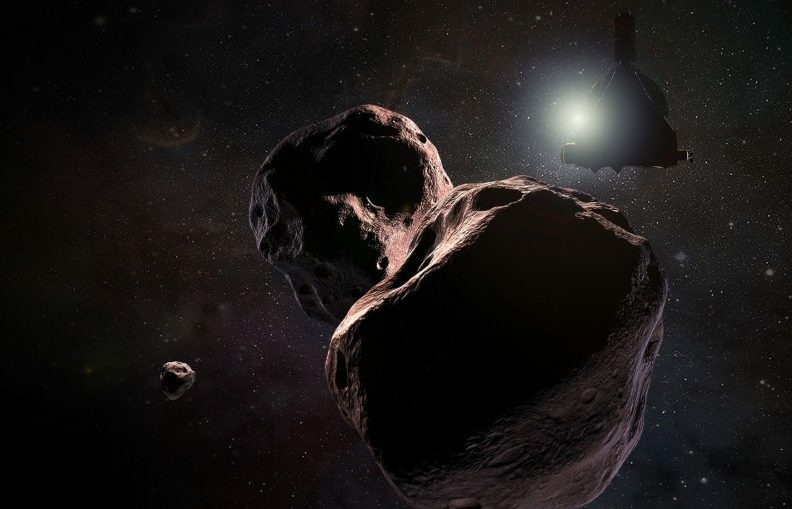 NASA’s New Horizons probe is just days away from its historic flyby of Ultima Thule, a mysterious object on the fringe of the solar system. Since it awoke from hibernation back in June, the craft has been making observations of the object, and that has raised the first puzzle – Ultima seems to be an unexpectedly “dark” world, and while there are a number of possible explanations, none of them have any precedent in the solar system. One of the main techniques astronomers use to figure out the shape of small objects, like asteroids and minor planets, is to observe their light curve. Basically, that means watching how the sunlight reflecting off the object’s surface changes over time, which can reveal how fast it’s spinning and what shape it may be. A perfectly round object, for example, would have a relatively flat light curve, since the same amount of light bounces off it from every side, while the cigar-shaped asteroid ‘Oumuamua has a much more variable light curve. But Ultima Thule has completely defied expectations. Previous observations have indicated that the object should be a fairly irregular shape, and may even be two separate objects orbiting each other very closely. That means it should have a pretty erratic light curve, but so far that hasn’t been the case. And it’s not that Ultima has turned out to be surprisingly round either – the New Horizons team so far has not detected any light curve at all. The researchers have a few possible explanations in mind, but none of them are particularly likely. For one, New Horizons might be approaching Ultima from exactly in-line with its rotation pole, which is possible but requires quite a coincidence. A second theory suggests that Ultima is shrouded in a thick cloud of dust, similar to the coma of a comet. The problem there is that this only forms when comets pass close to the Sun and the heat begins to vaporize material. Ultima is much too far from the Sun for that, so unless another heat source is at work, that doesn’t seem likely. Again, while that’s technically possible it would make Ultima Thule unlike any other body in the solar system. Plus, these moons would have to be very tiny and very close to the surface – last week NASA gave the probe the green light to approach the object on its optimal path after months of observations found no sign of any potentially hazardous moons or debris. Whatever the answer is, we don’t have long to wait. New Horizons is due to buzz Ultima Thule on New Year’s Day 2019 – next Tuesday. High-resolution images will be streamed back to Earth over the few days following that, giving us an up-close look at the most distant object ever visited by a spacecraft.